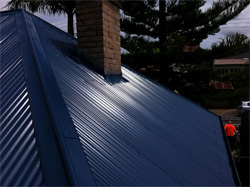 Would you like to lower your air conditioning bill while giving your roof a make-over? 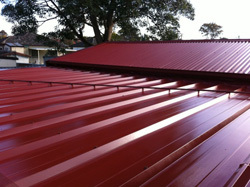 A roof coating doesn’t have to be white to be cool. As a result of ongoing research and development into heat reflective coatings, Astec© developed a new technology of colour infused nano ceramics that reflect heat by selective reflection of infrared light. This technology has enabled Astec© to offer dark colour exterior coatings that reflect fully 50% of solar energy and provide positive results for our environment and consumers. 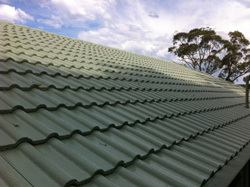 Energy Star© is a paint that can seal, waterproof and provide a beautiful colour to your asbestos, metal or concrete tile roof. The paint is tough and highly elastic which means that it will expand and contract with the roof without cracking or wrinkling. The selection of an energy efficient roofing paint translates into a lower internal building temperature while you your roof a well deserved make-over. Air conditioning power consumption is reduced along with green house emissions. If you want to give your roof a new look and want to save on your energy bill at the same time, then do it smartly, do it with Energy Star©! Sometimes the problem with the roof starts with the support. The wear and tear on rafters, barge boards, fascias and soffits can cause underlying issues with what seems to be a perfectly good roof. Maybe you need a roof frame for a new pergola or extension? Before you have a roofer look at your new roof requirements, make sure you have one of our carpenters look at the size and type of roof frame that will be required. If you’re looking to install sky lights or sky tubes, usually you will need a carpenter to install the internal fittings to complete that perfect finish. Repairs or replacements to rafters, barge boards, fascias and soffits.